Mercedes-Benz prototypes in the Mercedes-Benz Museum in Stuttgart, Germany. Knives, forks, and spoons made from a biodegradable starch-polyester material. The Arnisee, a lake in the canton of Uri/Switzerland. Musiktheater im Revier (MiR), an opera house in Gelsenkirchen, Germany. 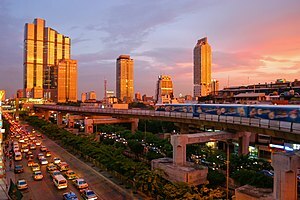 Sunset in Bangkok, showing the skytrain and modern skyline, taken from the corner of Thanon Silom. 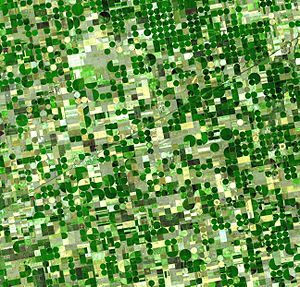 Circular crop fields in Kansas, characteristic of center pivot irrigation. Retreating glacier and its effects on the surrounding landscape. This image shows 10 seconds of a Montinari Milano. 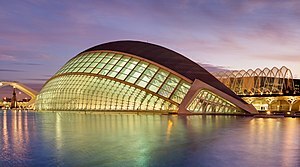 L'Hemisfèric at the Ciutat de les Arts i les Ciències in Valencia city (Land of Valencia, Spain). Amiga 500 with monitor, keyboard, mouse and floppy disk drive. Reuss River in the old part of Lucerne, Switzerland.